Kia says 32,300 SUVs need repairs to prevent stalling, damaged engines and potential fires. March 3, 2019 — Kia is recalling 32,300 Sportage SUVs because of problems with stalled engines due to oil pan leaks. The engines in the 2011-2012 Kia Sportage SUVs can be damaged by oil leaking from the pans, a problem that caused Hyundai to recall 120,000 Tucson SUVs. In addition, leaking oil may hit hot surfaces and start a fire. Hyundai contacted people at Kia about a plant that had problems with the assembly of engine oil pan seals that were failing and causing oil leaks. Kia investigated warranty claims and found 11 related to customers who complained about stalled engines related to oil pan leaks. The automaker says no crashes or injuries have been reported but the recall is necessary to prevent future stalling incidents. Sportage owners should watch for oil on the ground, illuminated engine or oil warning lights and smoke or burning odors coming from the SUVs. Kia doesn't know how it will fix the oil leak problems but engineers are working on it. Kia plans on contacting Sportage customers April 10, 2019, but concerned owners may call the automaker at 800-333-4542. Kia's recall number is SC174. 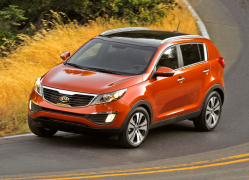 Read what drivers have told CarComplaints.com about their Kia Sportage SUVs.